The saga surrounding Aeroplan, Air Canada and Aimia has finally come to an end. Air Canada’s purchase of Aeroplan business from Aimia was completed today. Aeroplan program was spun off in 2005 when Air Canada was restructuring its businesses (and needed cash). Air Canada is still on schedule to launch new yet unnamed program in 2020. Miles from the Aeroplan will be converted at 1:1 ratio. Above is the announcement that Air Canada has been emailing to its members. You can access Air Canada here. Agreement in principle entered into with American Express for its continued participation in Air Canada’s loyalty program post 2020. MONTREAL, Jan. 10, 2019 /CNW Telbec/ – Air Canada announced today the successful closing of its purchase of Aimia Canada Inc., owner and operator of the Aeroplan loyalty business, from Aimia Inc. Air Canada also confirmed that Aeroplan Members’ Miles will be honoured on a one-to-one basis in Air Canada’s new loyalty program when it launches next year, in 2020. “Air Canada is creating an industry-leading loyalty program that aims to provide unmatched flexibility, choice and convenience for customers when it debuts in 2020. With today’s purchase of Aeroplan, we are taking a major step forward on this transformational initiative by acquiring one of Canada’s most popular loyalty programs. For many Canadians, given Aeroplan’s privileged access to Air Canada, it is the next best currency to the Canadian dollar,” said Calin Rovinescu, President and Chief Executive Officer of Air Canada. Concurrently with the conclusion of the Aeroplan purchase, Air Canada, The Toronto-Dominion Bank (“TD”), Canadian Imperial Bank of Commerce (“CIBC”), and Visa Canada Corporation (“Visa”) finalized various commercial agreements relating to and in support of the acquisition, including credit card loyalty program and network agreements for future participation in Air Canada’s new loyalty program. In addition, Air Canada has entered into an agreement in principle with American Express Canada, which also issues Aeroplan co-branded products, to secure its continued participation in Air Canada’s loyalty program after 2020. The aggregate purchase price for the acquisition consists of $450 million in cash plus $47 million in cash for pre-closing adjustments. The pre-closing adjustments relate to lower net liabilities assumed than projected. The purchase price is subject to post-closing adjustments and the acquisition also includes the assumption of the Aeroplan Miles liability. Air Canada received payments from TD and CIBC in the aggregate amount of $822 million. Visa also made a payment to Air Canada and assuming completion of the American Express agreement, AMEX will do likewise. In addition, TD and CIBC made payments to Aimia Canada Inc., now Air Canada’s subsidiary, in the aggregate amount of $400 million as prepayments to be applied towards future monthly payments in respect of Aeroplan Miles. It is interesting to know that they value the unredeemed miles (unclear how many – must be billions) that Aeroplan business has on its books at $1.9 billion liability. Half of Aimia’s 1,500 employees will move to Air Canada as part of the deal (not sure what the rest will do). There really wasn’t any other way of doing this. Air Canada announced that they wouldn’t renew their deal with Aimia and would launch their own program. This lead to stock market value of Aimia crashing. 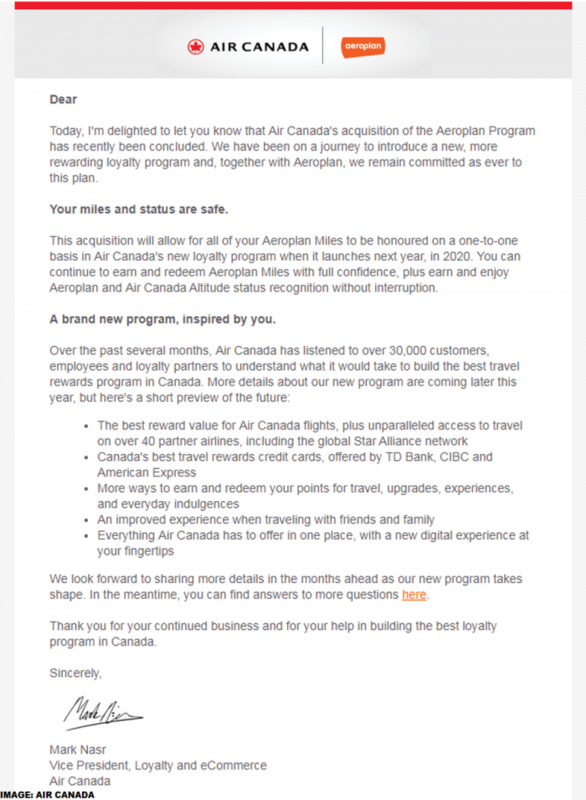 Now that Aeroplan is back in house it ensure smooth transition to the new program in 2020 (better burn those miles NOW though).